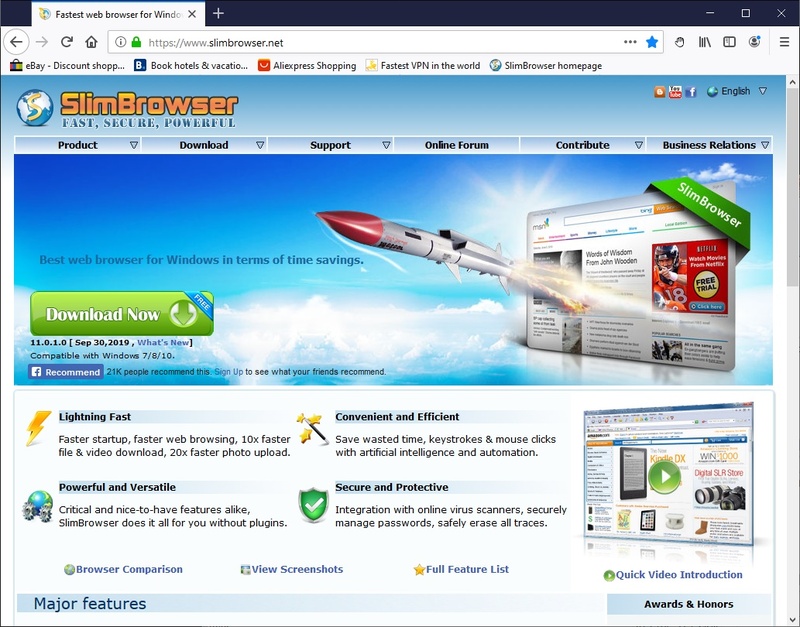 SlimBrowser is a fast and secure internet browser for Windows fully loaded with powerful features. It starts up quickly and opens web pages right in front of you with minimum delay. It is designed to let you browse the Internet carefree by guarding your personal information and protecting your privacy. SlimBrowser offers various functions and options so that you can go where you want and get whatever from you want from the Internet with as few clicks as possible and as little distraction as possible. 1. Built-in download manager boosts your download speed by up to 12 times and maintain a download history for you. 2. Intelligent form filler saves and completes web form for you automatically. 3. Popup blocker suppresses all annoying popup ads while you browse internet. 4. Web form spell checker proofs your online postings against spelling mistakes. 5. Ad blocker eliminate ad banners or other obtrusive components within web pages. 8. A large collection of skins available to tune the browser appearance to your own taste. 11. You can type pre-defined short alias instead of long URL to browse frequently visited internet sites. All the handy functionalities are packed into a compact setup file of only 2MB. Download the best browser for Windows now and see how it makes your web surfing a much more enjoyable experience. Statement: First, please download the orginal installation package by clicking the download link. Of course you may also download it from the publisher's website. Using SlimBrowser crack, key, patch, serial number, registration code, keygen is illegal. The download file hosted at publisher website. We do not provide any download link points to Rapidshare, Hotfile, Depositfiles, Mediafire, Filefactory, etc. or obtained from file sharing programs such as Limewire, Kazaa, Imesh, Ares, BearShare, BitTorrent, WinMX etc. Software piracy is theft. If you like SlimBrowser please buy it.